Well it’s been a busy month around here for the most part, although in some regards a little disjointed as it relates to family matters. Early in the month, Milissa returned to Indiana to deal with some estate issues and the sale of her Mom’s home. On July 7th Emily and Allison arrived in camp to begin their five week visit. Our oldest daughter Megan, who is enrolled at DePaul this fall, arrived on the 25th with her boyfriend Cody for what will be a quick two week visit. Milissa is buttoning up loose ends at home and expects to be back in camp the first week of August. The weather in July has been very unseasonable to say the least, with two predominant weather patterns. Either lots of fronts bringing rain, thunderstorms and cooler temps or plenty of sunshine and heat. Neither very good conditions to get much done in camp, especially some more painting which is high on our list of priorities again. I don’t know how much rain we have had in July for sure, but it was feeling a lot like June there for awhile with several rains of 1.5-3.0″. 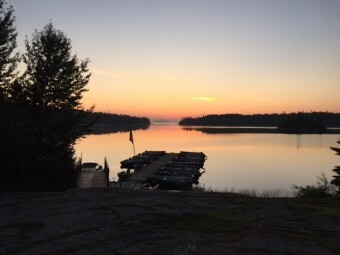 While dealing with that much rain wasn’t always the most enjoyable situation, it was badly needed to maintain the lake level which was dropping quickly from the summer heat, and to keep the risk of forest fires lower. 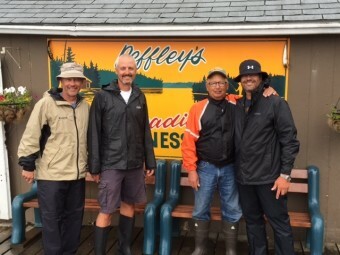 As far as the fishing goes, no one will confuse July with May/June or August/September when it comes to the numbers of walleye that are caught here that’s for sure. 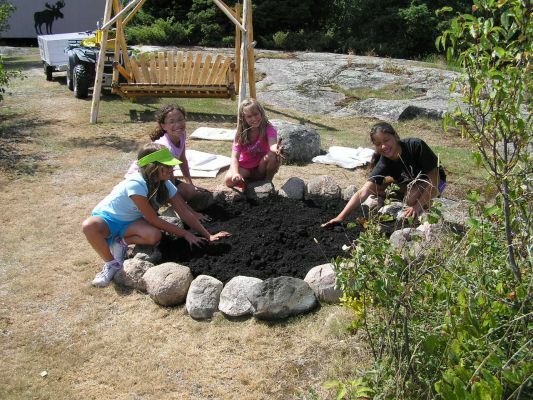 BUT, we have had a number of groups that have done extremely well during the month. 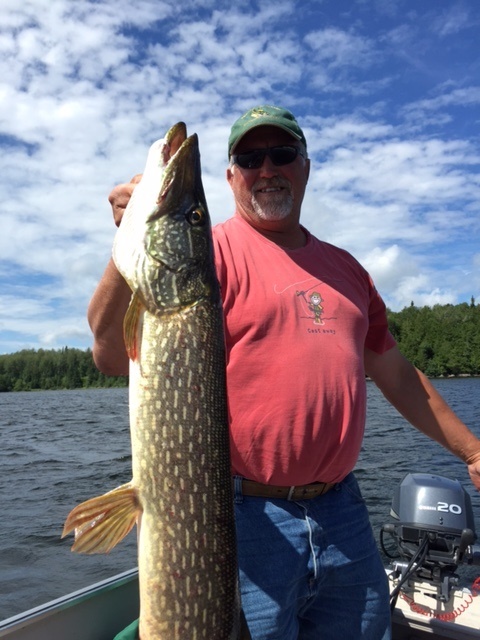 Jeff Norman’s crew of six caught 986 fish during their week of July 11-18th. Many of those fish being pike and smallies as the bite for northern and smallmouth has been outstanding all month. The key to July walleye success most often lies with our guests willingness to fish harder. 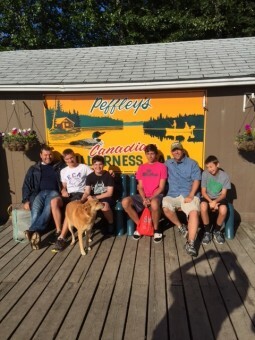 Fishing early (NEWSFLASH: 9 a.m. is not “early”) and late was very productive times for guests who fished these times. Bob Esselman, brother Paul and their wives Carrie and Pam, would likely take exception to this notion. 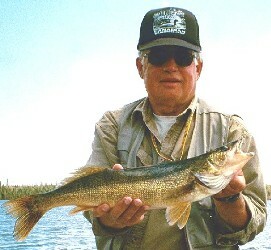 Never in a hurry and often “out by the crack of 10” Paul would joke, they consistently went about catching walleye all week long. 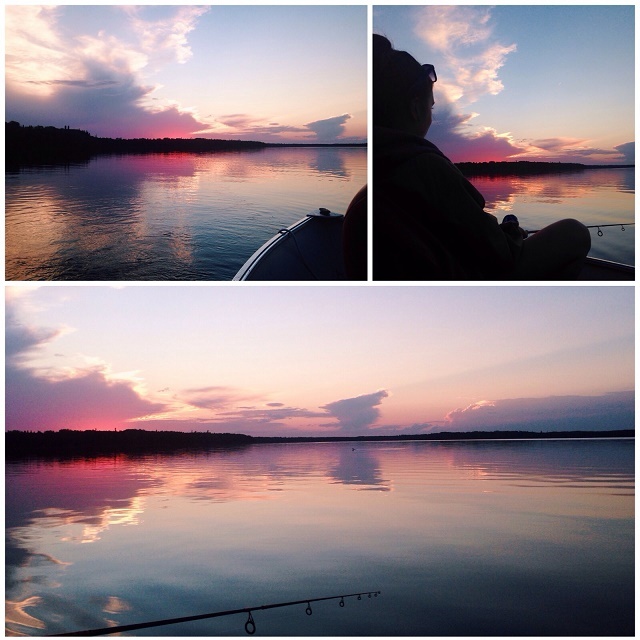 We tested the waters (so to speak) a few times throughout the month ourselves and found it pretty easy to catch 15-20 walleye in our boat in about 2 hours of fishing in the evening. The mayfly hatch is now a distant memory and every time out on the water now we are finding more and more aggressive fish. Looking forward to an outstanding finish to the season with some great August/September fishing. Good luck to all! 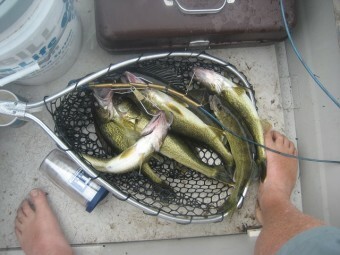 July walleye fishing- you have to use fingers and toes to keep count! Despite more rain than usual in July- the sunrise was just as beautiful. 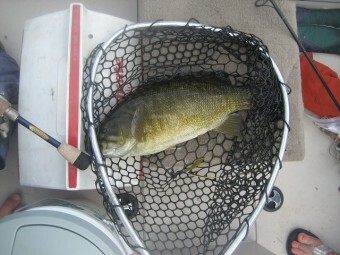 July smallmouth fishing has been fantastic. Tony and Troy with their sons celebrating Tony being cancer free! 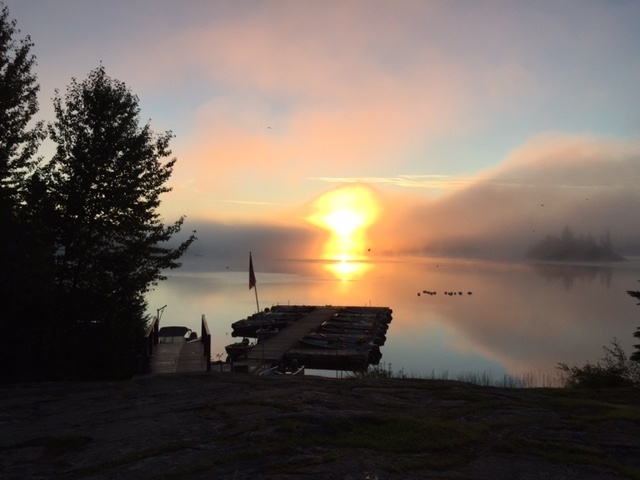 I have probably snapped a thousand sunrise photos here…and with good reason. 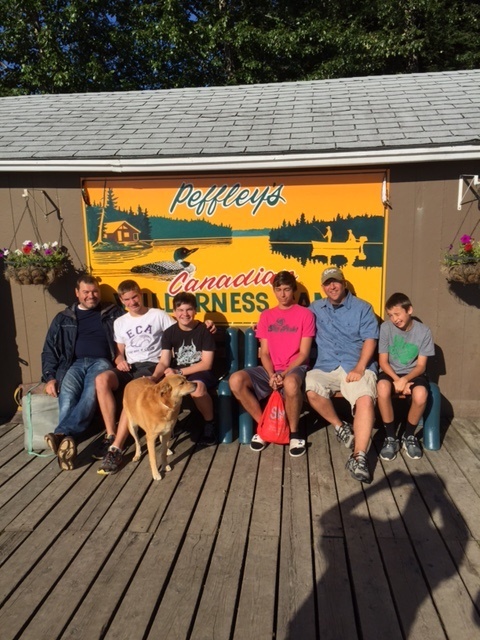 Shane, Carl, Ray and Greg- here from South Bend as part of a fundraising effort between Peffley’s Camp and St. Joe High School. Thanks guys! 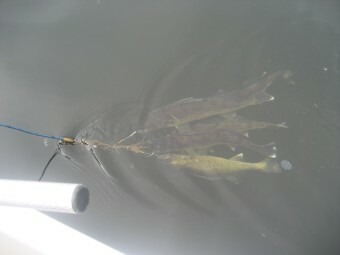 My monster pike, or maybe not…the art of picture taking. 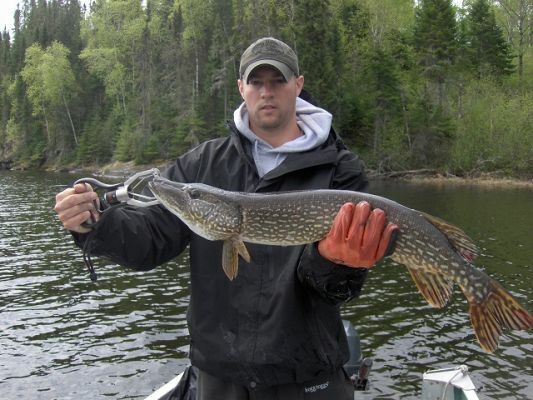 Guess the length of this fish.